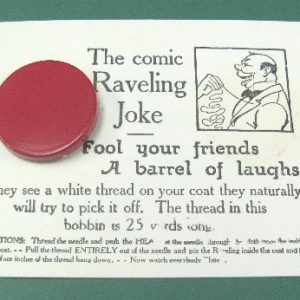 Acquired this from an old magic shop buy-out. 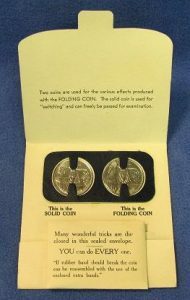 It comes with its original packaging and instructions and the two coins appear to have never been removed from their enclosure. The folding coin will more than likely need to have its rubber band replaced but we do not want to remove the coin from its original location. We will leave that to the new owner. The original replacement bands included with the trick have deteriorated so we will enclose new ones for you. 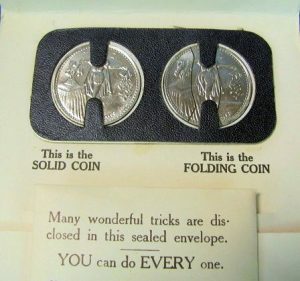 With this special coin you can perform a number of great tricks. 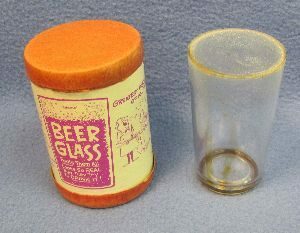 Pass a coin into a soda bottle or pass it through a finger ring, etc. 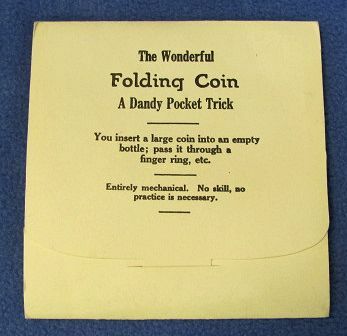 Comes with a matching solid coin for examination. 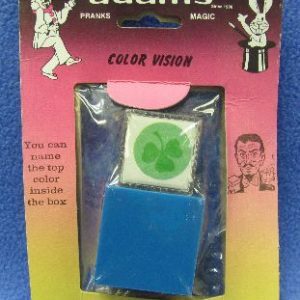 A great item for the Adams’ Magic collector.